Please note that these Gardens and woods can be explored only when Highclere Castle is open to the public. 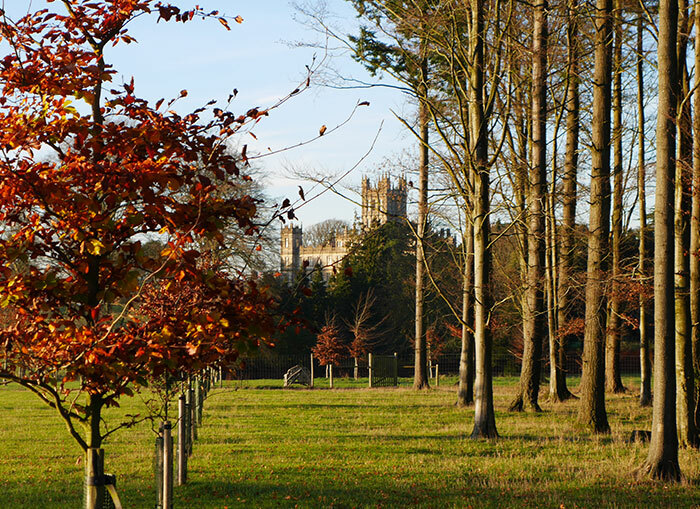 For footpaths and other seasonal walks please see the section Walks near Highclere Castle. To the south east of the Castle lies the Monks’ Garden – it’s name derived from the Bishops of Winchester who owned the Estate for 800 years before the Carnarvon family acquired it in 1679. Records in 1218 list 61 fruit trees which were replanted in 1364, when 44 apple and 27 pear trees were planted. Over the years it has been planted to become a more decorative garden, where climbing roses make a fine show in June above a border with penstemons, agapanthus and geranium. Lavender grows under the walls whilst a glass house is filled with Tea Roses for cutting as well as peaches and nectarines. There are espaliered medlar and pear trees amongst yew topiary that leads into a splendid White Border Garden. Behind a high yew hedge in the Monks’ Garden lies the White Border, with white roses and clematis scrambling up dark green obelisks, crambe, agapanthus, peonies, hydrangeas, poppies, and other plants providing wonderful foliage throughout much of the year. A gate in the White Garden wall leads into the enchanting Secret Garden with curving herbaceous borders, serpentine paths and riotous displays of colour in July and August. Beyond the Secret Garden lies the Wood of Goodwill. A newly planted woodland area with 38 native British trees including beech and oak. In the spring, snowdrops and daffodils fill the grassy areas with colour, and an avenue of young walnut trees lead down to a developing Rose Arbour with a camomile lawn and Wild Garden. A walk up the hill from the Wild Garden takes you past an Etruscan temple on one side, and a wild flower meadow on the other which has delighted visitors in summer months.